On May 12, 2014 Fund of Women Entrepreneurs organized one more workplace (pastry-shop) in social enterprise called “Saotsreba” on №32 Tamar Mepe St., Kutaisi with the participation of community union “We are creating a successful future”. In total 8 persons have been employed. The author of the project is Nino Verulashvili. The opening ceremony of the workplace was attended by an international evaluator-Mrs. Raisa Sinelnikava (from Belarus) and a national one –Mrs. Lia Kiladze (chairperson of KEDEC). On 15-16-17 April, 2014 trainings on social entrepreneurship, aiming at studying the necessary skills for social entrepreneurship and elaborating competitive projects, were held in a public college “Iberia” in Kutaisi. 16 persons took part at the training. All the participants were awarded by the certificates. They acquired all the skills necessary for opening a social enterprise. Fund of Women Entrepreneurs carried out a number of activities for the introduction of the concept and practice of social entrepreneurship in people. All the trainings on social entrepreneurship held by the organization aimed at creating innovations and new jobs in social sector. 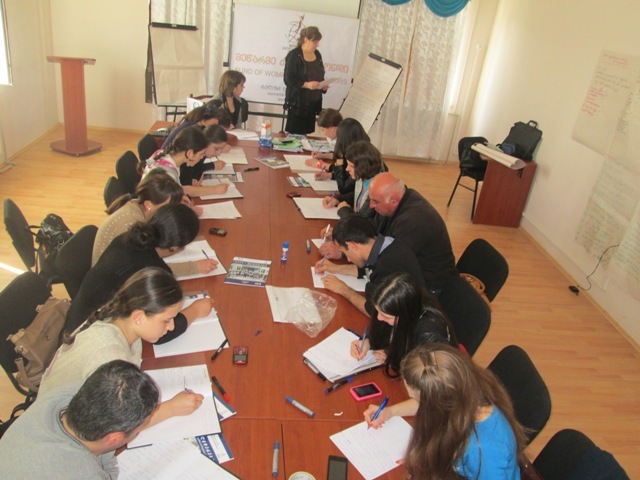 On 26-29, 2013 trainings on the issues of social entrepreneurship were held in Avangardi settlement by the FWE. The purpose of the trainings was IDP and local population’s (living below the poverty line) promotion and their involvement in agricultural and social activities. 15 persons from different communities attended the training. Three business-plans elaborated by the participants were submitted to the selection commission. One on them submitted by the representatives of Community Union “Avangardi 2013” was selected by the commission. Winner project “Our Incubator” was funded. After finalizing the business plan of the project, its presentation is planned in the Municipal Service on policy and strategic development of the city of Kutaisi.